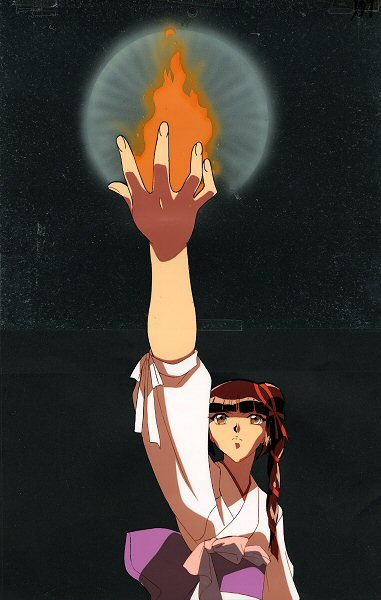 Updated 7/15/2012 Miyu uses her flame to rescue Reiha and banish the Shinma Oushuu. 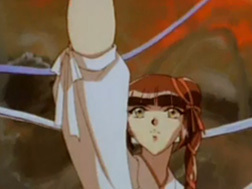 I was attracted to this cel because of its awesome foreshortening, the flame, and the fact that it is a large pan cel :D As I feared, it has some line fading, but only towards the bottom on her face and her body. Her hand and arm are in perfect condition oddly enough. 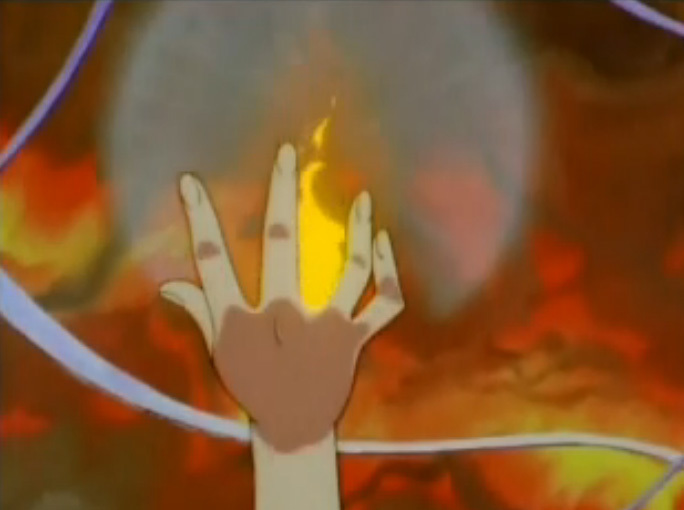 Only one cel is pan sized because the flame doesn't appear until the pan has been completed. Interestingly enough, the bright orange paint layer I have appears only as a barely visible orange fuzz in the screencap. So either I'm missing the bright yellow flame layer or it's a special effect, who knows :) It could be the C layer, but the shadows on her hand change when then fire appears so that could also be the missing C layer. It's a mystery. Either way, this is certainly one of those cels where you can learn something interesting about the process of animation by simply looking at it. I'm using the seller's pic for now, but I'll try to piece together a scan or take a nicer pic in the near future.